This system can inspect the thickness measurement (Bow/Warp), resistance measurement, microcrack inspection and surface / backside inspection. System throughput is 1 second/wafer. The loader unit supports cassette method or stack method. The unloader unit can classify into 13 categories by inspection results. The lifetime measurement unit can be installed with the option. 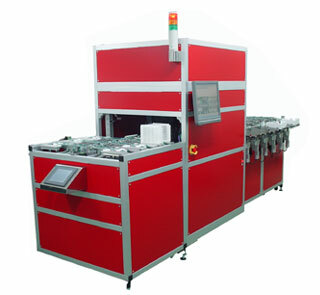 System throughput is 1 second/wafer at high speed. The loader unit supports cassette method or stack method. Very high cost performance then you can minimize the initial investment cost.